Melanie speaks at conferences and trains business executives around the world in the GRASP method for strategic influencing, negotiation, consensus-building, dispute resolution, and leadership and influencing skills for women. 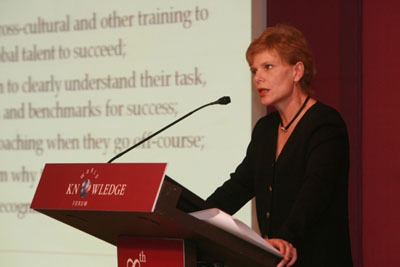 Her clients include leading organizations in the United States, Europe, Asia and the Middle East. All of her training workshops are practical, interactive, and individually customized to address the current challenges the client is facing, including tailor-made case studies and role plays. At the client’s request, she will work with participants to develop strategies for actual upcoming negotiations. For more information, contact melanie@beyond-dealmaking.com. New! Beyond Dealmaking training is now being offered in German! For information on German-language GRASP negotiation workshops conducted in Germany, Austria and Switzerland, click this link. Click here to view an article in Rundschau about GRASP negotiation workshops in Germany, Austria and Switzerland. "Melanie's insight and experience as a leading negotiation consultant across Asia has given her the unique opportunity to develop an innovative vision and simple, yet effective approach to negotiating; which will drive you and your business to higher levels of success." "I was able to put the lessons Melanie taught me immediately to work on a tough negotiation I was facing. I came away, one hour later, with better terms and an improved relationship. Without Melanie's training I could not have achieved this." "Melanie was a tremendous help in assisting the acquisition of Systems Access by SunGard Data Systems. She worked seamlessly with our executives and attorneys to ensure that the sale went smoothly for all parties-and negotiated a price that was quite pleasing to the Board and our shareholders. Her honest and forthright approach also helped the two companies maintain good relations throughout the negotiation, which has benefited us considerably as we move forward together as one. "Melanie's approach to negotiation is very appealing. She gets people from all national backgrounds to open up and see things from a fresh point of view. At the same time she is able to show us why outsiders act or react the way they do so that we can work toward building a better relationship." "Melanie's down-to-earth, win-win approach to conflict resolution and her friendly and approachable training style has made her a favorite with both management and staff." "I have never felt so confident going into a negotiation. Thanks!" "Melanie's training programs have always received the highest kudos from our members. For those of us who negotiate daily with institutions and governments around the world, the key to long-term financial success is in building strong relationships. Especially in tough economic times, it is those power of those relationships that will see your business through."